It is hard to square the central claim of Great Gatsby Curve proponents—of a link between income inequality and economic mobility—with recent trends in the US, or with variation within the country. Income inequality has widened considerably since 1979, according to data from the Congressional Budget Office. Much of this increase is driven by rapid income growth at the extreme upper tail of the distribution. Over the past 35 years, after-tax real incomes for the top 1 percent have grown by 200 percent, but real incomes for the bottom quintile have only grown by 48 percent. But despite this rise in income inequality, economic mobility in the U.S. has remained largely unchanged, according to a new study which measures mobility as the likelihood of a child in the bottom quintile rising to the top quintile in adulthood. So time trends offer no support. Perhaps the Great Gatsby relationship will hold if we compare different regions of the US? Again, not really. Drawing on data from another recent study by Raj Chetty and his colleagues at Harvard, I plot below the relationship between inequality (income share of the top 1 percent) and a measure of absolute economic mobility for hundreds of metro regions across the country. The correlation between mobility and upper-tail inequality is negative, but very weak. Family structure also impacts inequality. In fact, as I have written earlier, a Federal Reserve Bank analysis finds that changing family structure accounts for around half (49-52 percent) of the increase in inequality between 1969 and 1989, measured using the 50-10 ratio or 95-5 ratio. Income growth has been markedly higher for families with married parents, according to a recent study by Bradford Wilcox and Robert Lerman, using data from the Current Population Survey. Between 1980 and 2012, median family income rose 30 percent for married parent families, versus just 14 percent for families with unmarried parents. Family structure, then, affects both mobility and inequality—which also impact each other. 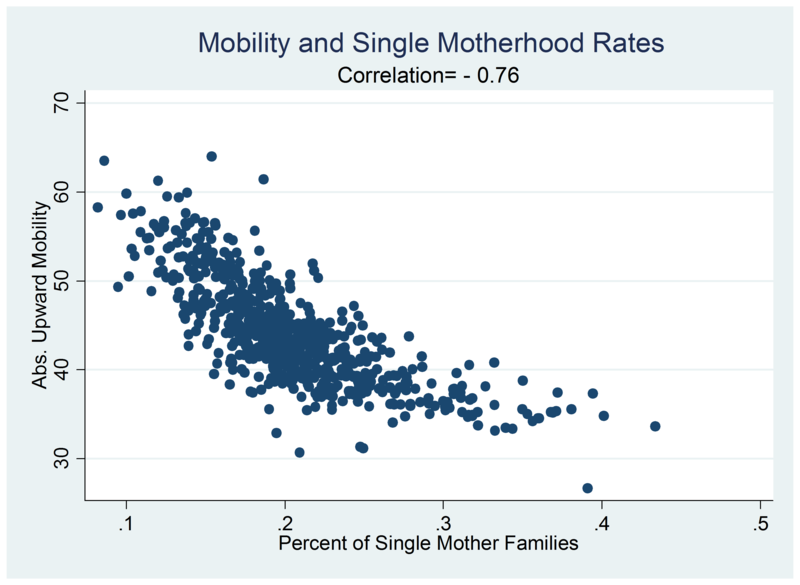 Lower incomes for single parent families may influence intergenerational mobility, for example, since single parenthood is highly correlated with children’s high school dropout rates, teen pregnancy rates and men’s labor force participation rates. 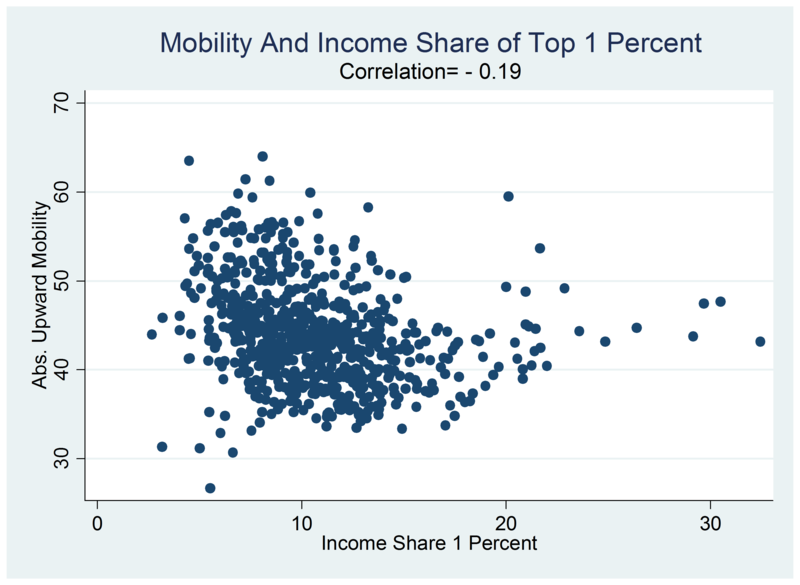 Perhaps inequality and mobility are correlated (see Scott Winship’s post in this series for a contrary view). But the real problem facing us is not rising incomes at the top, but deepening poverty and poor economic opportunities at the bottom, which are strongly correlated with a decline in traditional family structures. The Great Gatsby Curve, with its focus on rising inequality, distracts from the real issues facing American families. Improving mobility and reducing poverty requires addressing the challenges of single parenthood, particularly teenage pregnancies; improving the human capital of disadvantaged children; and encouraging labor force participation for both men and women. A host of policies such as expanding the EITC, boosting child care subsidies and improving access to quality education through school choice programs would help in this regard. Strengthening the family is the key to American opportunity.